Lead-acid technology has been around for over 150 years. 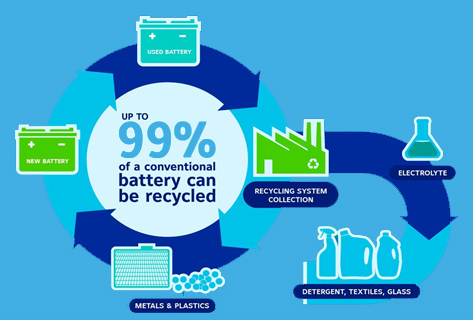 An innovative recycling infrastructure has been developed to recycle essentially 100% of a lead-acid battery, and industry-supported regulation ensures that these products are returned to appropriate locations. This system is utilized for the newer advancements of carbon-based lead-acid technology as well as established products. Other newer battery technologies can’t come close to the recycling advances and developed infrastructure to reclaim the lead-acid product. The processes for recycling lead-acid batteries and the facilities that support it have progressively advanced over the years and are one of the greatest recycling success stories in the global marketplace. Many innovative systems have been developed to harness by-products of the process and use them in a very beneficial capacity. For example residual sulphur trapped during the recycle process is processed into fertilizer for agricultural purposes. Also, heat from facility furnaces is used as a radiant heat source during cold weather, saving on traditional heating methods.